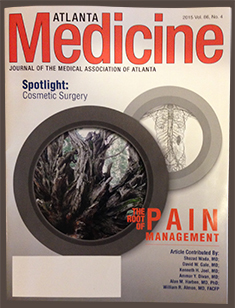 Dr. William E. Silver was featured in the 2015 Atlanta Medicine Journal of the Medical Association of Atlanta along with cosmetic surgeons Dr. Alexander Gross and Dr. Bernadette Wang Asraf. 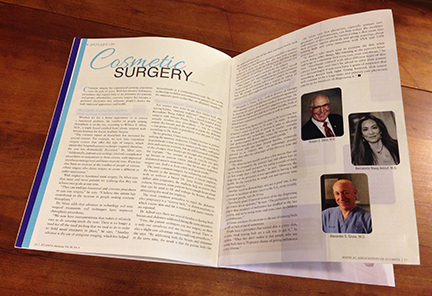 The feature article was on cosmetic surgery and its growing popularity over the last 15 years. In the article, Dr. Silver talks about how affordability and fast recovery time have driven the increase in cosmetic rhinoplasty. Whether it’s for a better appearance or to correct a functional problem, the number of people seeking rhinoplasty is on the rise, according to William E. Silver, M.D., a triple board certified plastic surgeon with the Atlanta Institute for Facial Aesthetic Surgery. With respect to functional nasal surgery, Dr. Silver says that more and more patients are realizing that they can achieve two goals at one time. Dr. Silver adds that advances in technology and non-surgical treatments and techniques have improved rhinoplasty procedures. Dr. Silver has been in practice for over 40 years and has performed thousands of aesthetic facial surgeries throughout his career. See before and after photos of his work, here. Dr. Silver serves patients from Atlanta, Dunwoody, Alpharetta, Sandy Springs, Buckhead, Roswell, Johns Creek, Marietta and beyond.